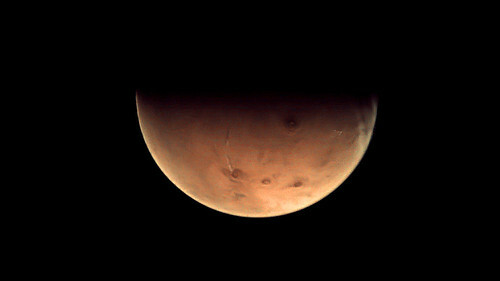 Marking its inauguration, ESA’s Malargüe tracking station receives Mars Webcam image. An image of the enigmatic Red Planet acquired by ESA’s Mars Express on 15 December 2012 was downloaded via ESA’s new tracking station in Malargüe, Argentina, symbolising ‘first data’ and recognising formal inauguration. Details on the station's inauguration via ESA web and ESA media. It'd be awesome if we could have access to the webcam feed. I'd happily set it as a screensaver or as a desktop background. A webcam of Earth would be nice too. Hi Kael: Nice idea! This however isn't really possible. While we somewhat poetically call it a 'webcam', the VMC camera in fact doesn't provide a real-time feed like, say, a webcam on Earth that is connected to the Internet and providing an update every few seconds or so (like this one). The images get stored on board and are downloaded in batches on a somewhat irregular schedule from the Mars Express mission control system. You can, however, simply access the Flickr stream (via http://www.flickr.com/photos/esa_marswebcam/) and there are several tools out there that will enable you to feed these into your desktop (see http://goo.gl/KLLWU).